There’s a new trend in the workplace: coworking. Co-working is an innovative alternative to traditional office spaces. The novel concept allows independent workers and entrepreneurs to share an open workspace instead of the traditional cubicle or makeshift set up in a coffee shop. Co-working has proven to be beneficial in both running a successful business and maintaining a professional career. So, why should you invest in co-working? 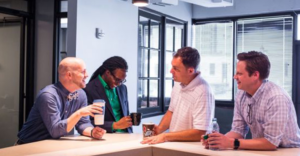 Co-working quickly and efficiently helps network, professionally and personally. While co-working you will encounter people from every business sector and walk of life who will likely be a useful connection in your future. Your business will grow exponentially with the addition of these new connections. Not to mention the new clients you are likely to discover while co-working. You are constantly surrounded by accomplished individuals who will be assets to your team. Assess the talent around you and recruit clients from your co-working space to help expand your business. Unlike the distractions of a home office or a public space, co-working allows for maximum productivity. There is no appeal to watch a few minutes (that turn into hours) of television or walk the dog to kill time. Co-working takes away the ability to easily shy away from your responsibilities. Being surrounded by committed, enthusiastic workers is highly motivating, increasing your personal output. Creativity flows in co-working spaces, unlike most other conventional offices. Want to share new ideas and get feedback on your thoughts? Co-working allows for constant collaboration with individuals who bring new perspectives to projects you may have never considered. These collaborations often lead to project or business expansions only made possible through co-working. Co-working is also a more affordable way to attain a high class work space. These spaces are typically in stellar locations that may otherwise be unattainable. They are designed with quality and functionality in mind, allowing you to be comfortable while you work. There is no pressure with long leases, increasing the flexibility of co-working even further. Because there is no need to purchase entities necessary for an operating office, like desks, printers, or lighting, overhead costs are greatly reduced. Dealing with seemingly constant repairs, service fees and office maintenance are a thing of the past when co-working. Additionally, co-working creates a sense of community instead of the isolation that often comes with growing a business, or freelancing. It is easy to feel lonely when working behind a computer all day, especially in a home office or a crowded office. Co-working gets rid of the notion that you are alone in your work and heightens the social aspects of your work life. The increase in interaction with others throughout the day is healthier for the mind and body and results in a happier you. of a work place, while diminishing the negative effects of working in an office space, home office or public place. There is a constant feeling of community in a shared working space, with the possibility of expansion of business, clients, and networking. Co-working maximizes productivity and creativity. The non-binding, affordable shared space is a no brainer when looking to cut costs while maintaining quality. 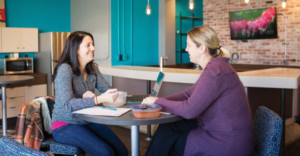 See how co-working can change your business, today!